The Copacetic Comics Company in Polish Hill, 3138 Dobson St, 3rd Floor, Pittsburgh, PA 15219 - Call (412) 251-5451 for more info. WESA Covered the Launch of "Larimer Stories." I was invited to create a new work of art in an edition of 20 for this year's CSA PGH (Community Supported Art). My work will be bundled and sold in CSA package along with five other local artists. CSA shares go on sale September 1st. I will ALSO be tabling and selling small artworks at the Small Mall Market. September 22nd between 5:30pm-10:00pm @ Space Gallery, 812 Liberty Ave, Pittsburgh, PA 15222. I'll be giving an artist talk at The Lantern (600 Liberty Ave.) on Thursday, August 10th @ 6:00pm. Kota (our Husky) will be there to field questions about the drawings and sculptures on display. Hope to see you there. Here's a MAP. My solo exhibition at The Lantern Gallery in Downtown Pittsburgh opens Friday, July 7th from 5:30-10:00pm. 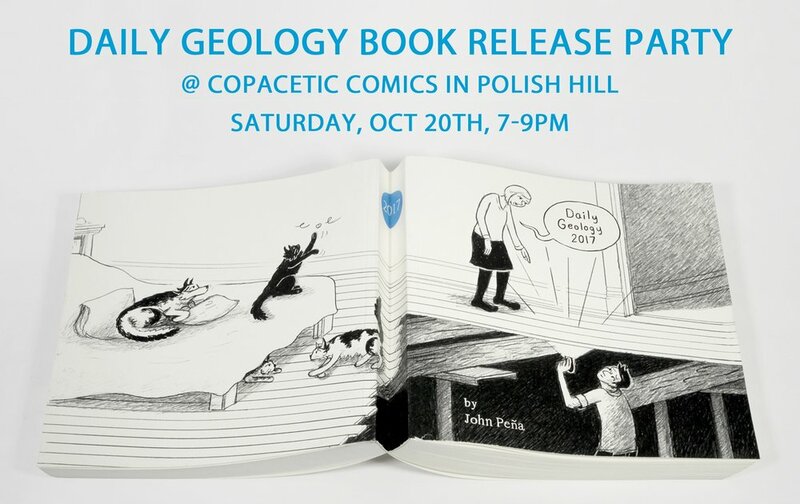 There will be a new installation of my word balloons as well as Daily Geology drawings and books available. Hope to see you there. To view my studio process leading up to the event check out my Instagram feed @johnpenastudio. I was recently interviewed for the Fall Issue of Venison Magazine. Check it out!!! I was recently interviewed by "Dear Pittsburgh" and had a great time. We talked about process, making a living as an artist and navigating historical defenses. Arts and Entertainment Writer Jack Trainor wrote an article for The Pitt News on "Daily Geology." My installation at The Mattress Factory Museum in Pittsburgh will be up through May 31, 2015. I was interviewed on Tell Me Something I Don't Know by Jim Rugg and Jasen Lex. Enjoy!